"Problem solving plays an important role in mathematics and should have a prominent role in the mathematics education of K-12 students." 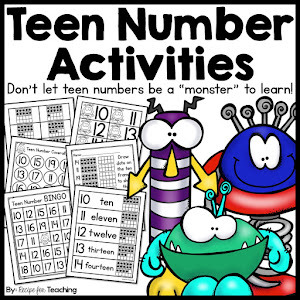 ~NCTM (National Council of Teachers of Mathematics) I love teaching math and I love using manipulatives to teach math. Open-ended math problems are one of my favorite ways to teach math because they allow my students to see there can be more than one way to solve a problem and there can be more than one answer to a problem. It also shows them that just because their friend solves the problem one way, it doesn't mean they have to solve it the same way. We have been working a lot on addition and I wanted an open-ended problem for my students to solve. 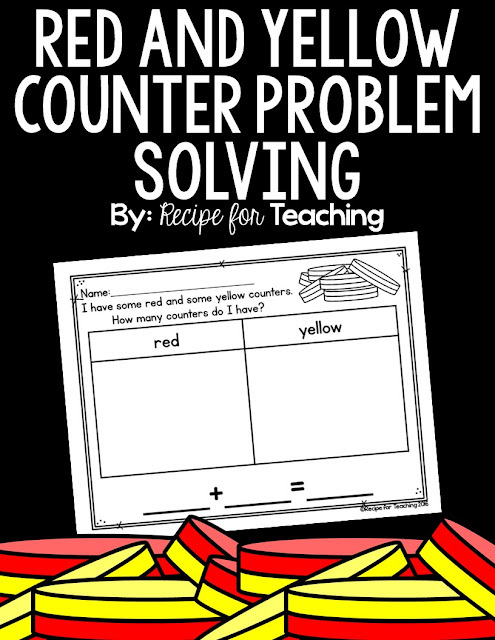 I came up with a problem where my students used red and yellow counters to add. The problem was: I have some red and some yellow counters. How many counters do I have? To introduce the lesson, I read the problem to my students and we really discussed it together. 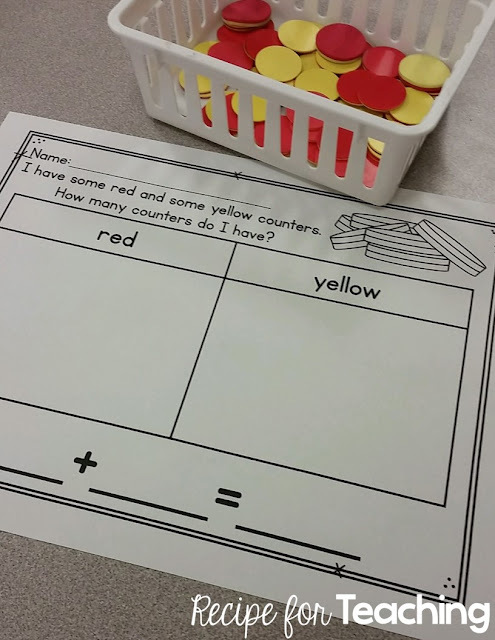 Before they went to work I had them share with a friend how many red and how many yellow counters they planned to put on their paper. This discussion really helps them to get an idea in their head and it also helps students who might be struggling with an idea to hear an idea from a friend. I put baskets in the middle of their tables so they could share manipulatives. I love how this friend colored the top of the organizer the colors of the counters. My students even noticed that when we shared their work! I was so impressed with their work and I said to my kids, "You all ROCKED that!!" And one of my kindergarten friends replied back, "Oh yes we did rock that!!" I love when they get excited about their learning! I told my students they could trace the counters if they wanted or they could just draw the circles. I thought it was really neat how some of my students arranged their counters in the same way that they see them on the dot cubes! After they finished we came back together as a class to share the different ways they solved the problem. I think sharing their work is really important not only so their peers can see what they did, but so they get comfortable with speaking in front of their classmates. 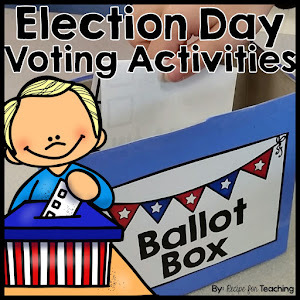 My kiddos did such a great job with this and I wanted to share it so that you can try it with your students too! Just click the image below to grab your FREE download. 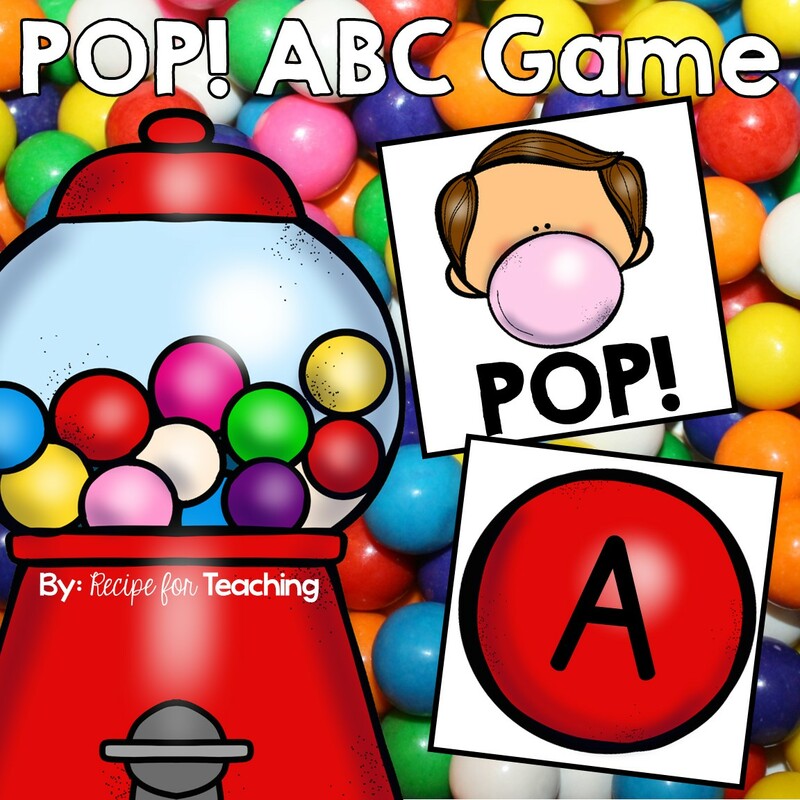 If you use it with your students, I'd love to hear about it! 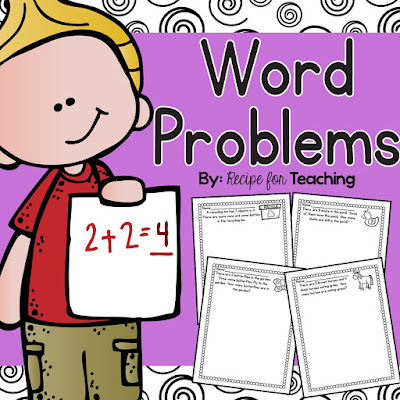 You might also be interested in my word problems pack in my Teachers Pay Teachers Store. Just click the image to check it out!